I know of a squirrel that has been quite busy lately. A few days ago I opened my garden shed and discovered a pile of pignuts. The pointed mound measured almost two feet high in the center. A lot of pignuts. The yellow pignut looks a great deal like a walnut. The large pile shocked me at first. I presented the issue to the Master Gardeners at our monthly meeting a couple of days later. As if in unison, they all agreed that it had to be a squirrel. 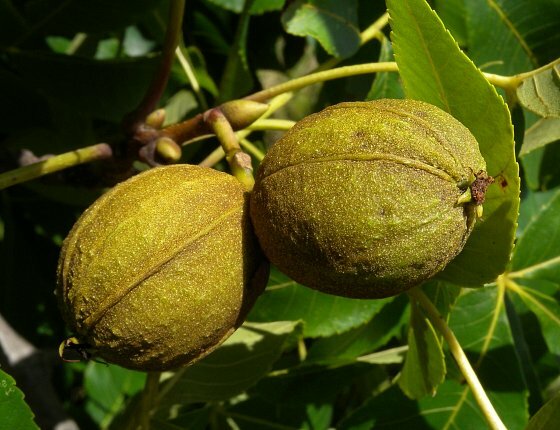 Pignuts come from the Carya glabra or hickory tree. The 1900 edition of Liberty H. Bailey’s Cyclopedia of Horticulture described the value of the wood from this tree. Here in New England it is considered a hardy native ornamental tree. Bailey too discussed the nut. Somewhere out there, scurrying around, is one industrious squirrel who has been quite busy carting these edible pignuts off to my garden shed. Unfortunately he will have to find a new storage spot since I have sealed up the opening in the shed’s foundation.